Posted September 29, 2014 & filed under Blog, Fundraising, In The Press, Potwell Dyke Flood Group. Brendan Haigh, chairman of the Civic Society said the work the Flood Forum was doing in Southwell tied into the Civic Society’s aim to protect and preserve the town. He said “If Southwell is to be repeatedly threatened with flooding then that inevitably will affect its character. To preserve the town means protecting it from threats such as further flooding. 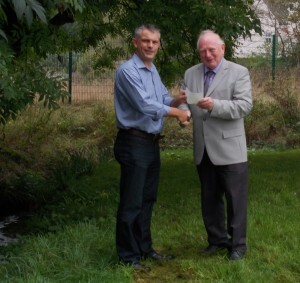 The cheque presentation took place in Minster Fields, near to the Potwell Dyke which broke its banks when Southwell was seriously flooded in July 2013. Hundreds of homes and businesses were flooded when two months-worth of rain fell in the town in just 30 minutes. Many people were unable to return to their homes for several months. 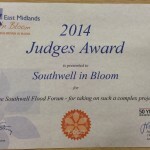 Southwell Flood Forum was founded following the incident to try to find a solution to the issues that led to the flooding. The Forum is working alongside other agencies to implement flood mitigation measures. Posted July 19, 2014 & filed under Alerts, Blog, Community Resilience, Flood Mitigation, Potwell Dyke Flood Group, Watercourse Clearing. 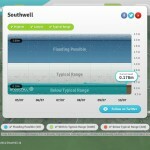 The new Shoothill GaugeMap shows river level data for the River Greet in Southwell. Posted July 17, 2014 & filed under Blog, Community Resilience, Emergency Planning, Events, Halam Hill Flood Group, Potwell Dyke Flood Group. Posted June 25, 2014 & filed under Flooding News, In The Press, Potwell Dyke Flood Group. On 12 March 2012, Environment Agency officers attended an incident on the Potwell Dyke watercourse in Southwell, Nottinghamshire. The incident was reported by Severn Trent Water who said that water pollution had discharged into the watercourse from their combined sewer outfall. 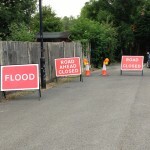 Posted June 1, 2014 & filed under Blog, Emergency Planning, Halam Hill Flood Group, Potwell Dyke Flood Group. Posted May 29, 2014 & filed under Blog, Flood Mitigation, In The Press, Potwell Dyke Flood Group. Posted January 19, 2014 & filed under Blog, Fundraising, Potwell Dyke Flood Group. Fundraising Event in aid of Southwell Flood Mitigation. 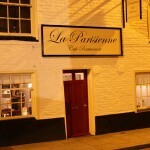 at La Parisienne Cafe Restaurant, King Street, Southwell. Posted December 22, 2013 & filed under Blog, Potwell Dyke Flood Group.